Winter has moved into the Hudson Bay area near the town of Churchill, Manitoba with ice becoming the new blanket for the landscape. As winter approaches in the Hudson Bay in Manitoba, Canada, the entire landscape including rocks, water and streets become an icy creation. Thick ice chunks form atop the rocks as soon as the tide recedes as the temperatures around Churchill drop well below zero. 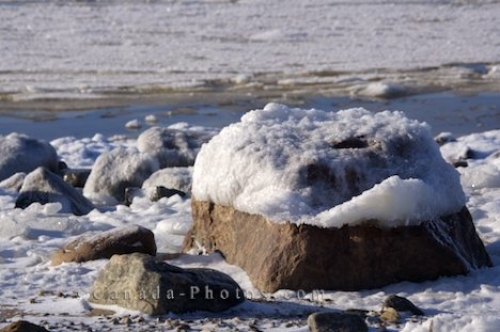 Ice covered rock near the town of Churchill, Hudson Bay, Manitoba, Canada. Picture of the ice that forms on the rocks along the water's edge of Hudson Bay near the town of Churchill, Manitoba.